Hello everyone, David again with another viewer question. 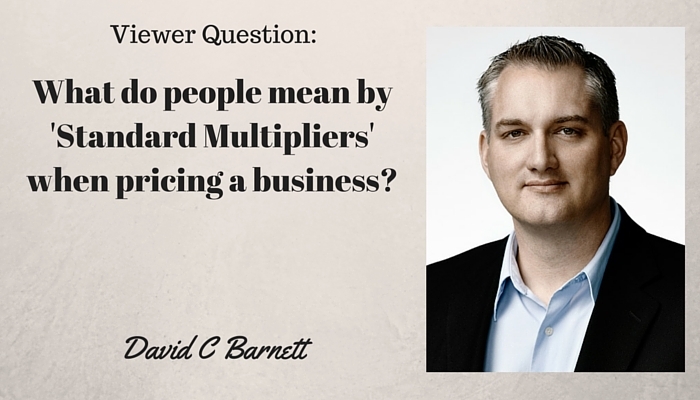 Well here’s the idea: if you multiply the earnings of a business by a number, you get a value. If you use the right magic number you find out the value of the business. My preferred method of doing this kind of thing is called the Direct Market Data Method. When doing this you need to normalize the financial statements using a proper set of rules. Then you research the subject company and find what others have paid for similar sized businesses in the same industry using databases created by valuation professionals. You then multiply the cash flow by the factor you discover in your research and find what’s called an Enterprise Value. You then need to adjust this value based on operating capital that forms part of the transaction. As you can see, this is not a simple thing for amateurs. If the wrong data is researched you get a bad result, if the wrong normalizations are done, you get a bad result, etc. Let me give you some examples. A small mom and pop restaurant might be valued at 1.1 times SDE (Seller’s Discretionary Earnings) while a septic pumping business with the same amount of cash flow could go for 3.6 times SDE. A larger restaurant with 100 employees may go for 2.8 times SDE. As you can see, if you try to apply a ‘standard multiplier’ to these businesses, you either end up over or under valuing them. The reason the multipliers change by industry and enterprise size is because of the differing degree of risk. What I love about this method is we actually get to apply the opinion of past buyers as to the degree of risk they saw in their transactions. In one crazy case I was asked to review a business valuation which had been prepared by an accountant. The guy had taken net income, multiplied it by 4 because he thought this was the right ‘standard multiplier’ and used the result as the value of the goodwill. Then he calculated the net operating capital and added this. Then he estimated the value of the fixed assets and added that too. The result was a million dollar valuation on a business that put $100,000/year into its owner’s pocket including his salary. This would be the type of value we might see on the stock market for a publicly traded company and it obviously didn’t make any sense. So, when you hear someone defend an asking price on a business because of ‘standard multipliers’ you should be very cautious. It may mean that you’re talking to someone who doesn’t quite know what they’re doing. They may be trying to use jargon which they think is impressive to bully you into agreeing with what they’re trying to sell. Anyone who is going to buy or sell a business should engage an experienced and qualified person to value the business and understand fully how the final number was arrived at. Also, there are some simple ways to ‘test’ any figure that I share with my clients regularly. Also, I have a new FREE tool for business owners. 15 questions to ask yourself daily to help maximize the value of your business. Download it free here: https://gum.co/15Questions/FREE Remember, I DO NOT automatically add people to any e-mail marketing lists without their permission.